In a 2-quart saucepan, place the eggs in a single layer. Add enough cold water until it is at least 1 inch above the eggs. Heat uncovered to boiling over high heat. Remove the saucepan from the heat. Cover with lid; let stand 15 minutes. Immediately pour off the hot water from the eggs, then run cool water over them in the saucepan until completely cool. Tap each egg lightly on the kitchen counter to crackle the shell. Roll the egg between your hands to loosen the shell, then peel starting at the large end. If the shell is hard to peel, hold egg under cold water while peeling. Roll the egg between your hands to loosen shell, then peel. If shell is hard to peel, hold egg under cold water while peeling. 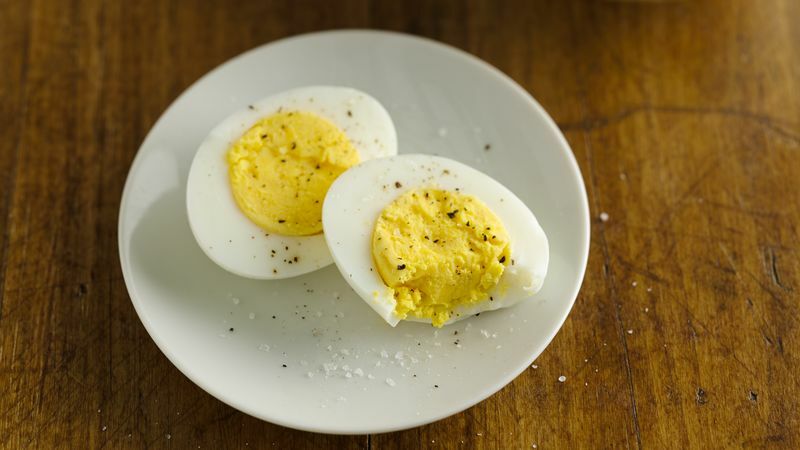 Avoid keeping hard-cooked eggs at room temperature for more than 2 hours. If you do, don’t eat the eggs.